Jackie Kay - Poetry Live! 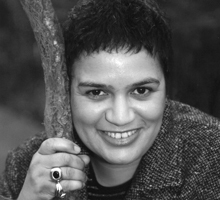 Jackie Kay is one of Britain best loved poets. She was born in Edinburgh, Scotland in 1961 to a Scottish mother and a Nigerian father. She was adopted by a white couple at birth and was brought up in Glasgow, studying at the Royal Scottish Academy of Music and Drama and Stirling University where she read English. The experience of being adopted by and growing up within a white family inspired her first collection of poetry, The Adoption Papers (1991). The poems deal with an adopted child’s search for a cultural identity and are told through three different voices: an adoptive mother, a birth mother and a daughter. The collection won a Scottish Arts Council Book Award, the Saltire Society Scottish First Book of the Year Award and a commendation by the Forward Poetry Prize judges in 1992. Her other collections of poetry include Other Lovers, Off Colour, Life Mask and, most recently, Darling: New & Selected Poems. Her first novel, Trumpet, published in 1998, was awarded The Guardian Fiction Prize. Her dramatised poem, The Lamplighter was published in 2008 was shortlisted for the 2009 Saltire Society Scottish Book of the Year Award. Her Maw Broon Monologues, performed at the Tron Theatre in Glasgow, and combining rhythmic verse and music, was shortlisted for the 2010 Ted Hughes Award for New Work in Poetry. Her latest book is Red Dust Road (2010), a memoir about meeting her Nigerian birth father and her latest collection of poetry, Fear, is published in 2011.